CED has been running its capstone project â€œEntrepreneur Speaksâ€ since 2012 with the support from various organizations like commercial banks. 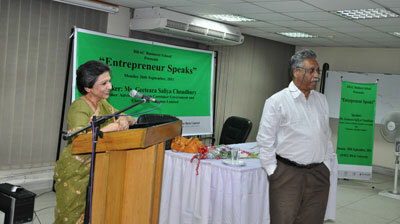 CED facilitated the â€œEntrepreneur Speaksâ€ sessions and conducted 6 sessions with so far. To date the speakers who held the spotlight in the podium are eminent entrepreneurial figures: Ms. Geeti Ara Safia Chowdhury, former Adviser to the Interim Caretaker Government, Chief Executive Officer, Adcom; Mr. Abdul Muktadir, Managing Director, Incepta Pharmaceuticals Ltd.; Mr. Abdul Matlub Ahmed, Chairman, Nitol Niloy Group; Mr. Fazlur Rahman, Chairman of City Oil; Mr. Piyush Patel, PL Studios, USA; Mr. Ken Stoner from TEDx OKC, Kelson Research Group, USA; Mr. Jeff Moore, Center for Creation of the Economic Wealth, University of Oklahoma, USA; Alhaj Sufi Mohammed Mizanur Rahman, Chairman, PHP group; Mr. Latifur Rahman, Chairman & MD of Transcom, and Mr. Iftekharul Islam, Adviser, Sanofi, South Asia Region. All the sessions were highly appreciated by the students of BRAC University and the high attendance rates also indicated that the participants were well received and the sessions were thought provoking to them. As a continuation of the program, CED is planning to organize similar sessions upon the basis of receiving continued support from various funders.